When she first started lifting, it was about quality time with her husband. But once Latresia discovered competition, she found a reason to make bodybuilding her passion. Latresia Pugh knows what pressure looks like. 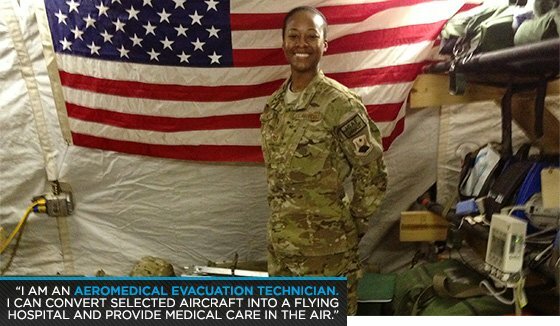 She has seen the effects of war first-hand in the military transport services, carrying injured servicemembers back stateside to receive medical care. They can rest easy knowing that strong allies like Latresia are there to protect them when they are at their most vulnerable. Besides her sworn duties, Latresia has also competed and won in figure competitions overseas. When she returns from her latest deployment, she will have a tough choice to make between competing federations. In the meantime, we honor her as this month's Military Bodybuilder of the Month! Tours of Duty: Spangdahlem AB Germany, Nellis AFB NV, Ramstein AB Germany. Please Describe Your Duties in the Military. I am an aeromedical evacuation technician. I can convert selected aircraft into a flying hospital and provide medical care in the air. I transport sick and wounded warriors, coalition forces and civilians from one location to a higher level of care. When my husband separated from the Army in 2007 I was stationed at Nellis Air Force Base in Nevada. I was working the night shift in the emergency department, and I would sleep all day because of the hours. I wanted to spend more time with him, so I would tag along to the gym every day before work. I fell in love with weight training and was amazed by the changes to my body. I wanted to see more results! A year in a half later I deployed to Bagram Airfield in Afghanistan, where I had enough time to focus on my training and nutrition. The rest is history. When I came back from my tour of duty everyone always asked me, "Do you compete?" I had never thought about competing. Shortly after that, I decided to do some research, and I saw it was something I would like to try. But then military life struck: I had to go to flight school, followed by a permit change of station to Germany. A few months after I arrived in Germany I saw a flier for a local military figure and bodybuilding competition. My husband and I went to watch the show. I decided then, that I would be competing in that competition that following year—or so I thought. I later found out that I would miss that competition due to deployment. After returning from deployment, I needed to find someone to help me with my posing and competition diet. I found my awesome coach, Sandi Griffin, who helped me with every aspect of competing. After three years of waiting patiently I finally entered my first figure competition in May 2012, the US Army Garrison (USAG) Kaiserslautern Figure and Bodybuilding Championship. I won first place in figure tall! I entered another competition three months later, the USAG Stuggart Championship, and won first place figure tall and women's overall! I am graduating from the military shows this year to pursue my dreams further. I am currently deployed in Afghanistan and am training hard to be ready to compete in Germany and internationally this fall. I joined the Air Force two months after my high school graduation. The hardest part was living away from home in Germany at 18 years old. But with the camaraderie of my unit and great friends, I adjusted quickly. In the military we have to stay fit to fight. We have to be prepared at a moment's notice to take on any challenges we are faced with, whether it is physical, mental, or emotional. Being involved in some sort of physical fitness helps us excel in any situation. I always wanted to be a physical therapist. Aeromedical technician is a special duty. My regular job is as a medical technician, and I am also an EMT. I could find a job outside the military doing something similar to either one. Each service as their own PT standards, and some branches have different components like pull-ups and shuttle runs. In the Air Force, we measure muscular strength by 1-minute push-up and sit-up assessments, aerobic fitness by performing a 1.5-mile run, and body composition assessment from abdominal circumference. It took me a while to find out how I could balance both personal and professional goals. I learned a lot last year. I have trained, competed, and won two figure competitions while studying for E-6 promotion. I have accomplished several achievements at work, received many awards and stay active in the Kaiserslautern Military Community. In the Air Force if we meet or do not meet our physical fitness standards, it is recorded on our evaluation performance reports. If you fail your PT test, it could ultimately affect your career or future promotions. Sometimes due to my flying schedule I may not be able to get two hours of working out in the morning. I could get called in the middle of the day to fly to another country to transport a patient. I may have to work late at times to get something time-sensitive accomplished, pushing my cardio session back. I try to avoid these scenarios as much as possible, but I have to sacrifice sometimes. Do you think it's more or less difficult for military women to stay in shape, as opposed to civilian women? It is probably easier for military women only because we get selected time throughout the duty day for fitness, but even if we didn't, everyone should make time for some level of physical activity. It should be a part of your everyday routine like brushing your teeth and taking a shower. My job requires a higher level of strength due to having to safely lift heavy patients with potential extra equipment attached to them on a litter. I am going to take this as far as I can. I plan to compete in Germany and try my hand in a couple of federations before I leave. Depending on how well I do overseas, I will decide what competition or federation I will compete in when I move back to the states. It helps me stay healthy and conditioned. I think I also inspire people who work close with me to watch what they eat. They see what I do when dieting for competition and try to help me by eating healthy and not having snacks in the office. Erin Stern and Ava Cowan. Be careful and know what you are putting in your body. Do your research and get the help of someone who has done what you are trying to accomplish. Have a great support system around you.